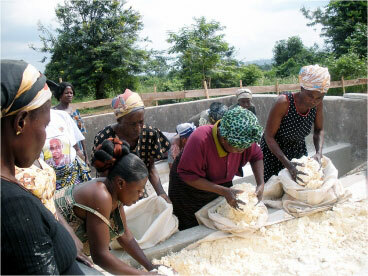 (Nanowerk News) Cassava is a tropical root vegetable and staple crop for millions of people in sub-Saharan Africa. However, it’s tricky to handle: Once the root is removed from the ground, it spoils within one to three days, so farmers must get it to processing centers as soon as possible after harvesting it. If they don’t, the crop goes to waste. A simple way to prolong cassava’s shelf life could help farmers avoid that waste and sell their crop beyond their local region. Paula Hammond, MIT professor of chemical engineering, and other scientists are now working on an innovative way to help them do that, using nanotechnology — technology that controls material at a molecular or atomic scale. Their idea is to design a plastic storage bag lined with nanoparticles that would react with oxygen, preventing the roots’ oxygen-induced rotting. “That would enable farmers to harvest and store and process at times convenient to them,” says Hammond, who traveled to Kenya and Ghana last summer with an international group of scientists to meet with farmers and come up with new ways to improve agricultural efficiency. It may seem odd to send Hammond, a chemical engineer who focuses on nanotechnology, into rural Africa to help farmers. But that’s exactly the point, says Todd Barker, a partner for the Meridian Institute, which organized the trip with funding from the Bill & Melinda Gates Foundation. After the Meridian Institute identified three agricultural chains where farmers needed help — cassava, dairy and maize (corn), Barker enlisted Jeffrey Carbeck PhD ’96, a chemical engineer and entrepreneur, to identify scientists who would fit in with the mission. “I was looking for people who had a deep technical background but had shown they could apply it in multiple areas,” says Carbeck, who knew Hammond from their graduate school days at MIT. Carbeck thought that Hammond, an expert in designing polymers for drug delivery, sensors and energy, would fit perfectly. Hammond, in turn, was intrigued by the idea. “It sounded like such an important problem, and I had never been to Africa. This was a chance to see it from a very unique perspective,” she says. Equipped with Land Rovers and digital video cameras, the group of a dozen scientists from around the world traveled to farms throughout the two African nations, talking with farmers to find out the biggest obstacles they face. The team found that dairy farmers have a similar problem to cassava farmers — getting their milk to processing centers before it spoils. Most farms don’t have their own refrigeration facilities, so the farmers have to carry their milk in plastic jugs, usually on foot or bicycle, to the nearest cooling center. If the cooling centers are far from the farm, the farmers might make only one trip a day, so any milk produced after that trip is in danger of spoiling before the next day’s trip. Milk that goes bad is rejected at the center and dumped out. To avoid that waste, Hammond and other scientists in the group came up with the idea to design a milk container with a nanopatterned, antimicrobial coating that would preserve milk longer than a plain plastic jug. The African dairy farmers are also interested in a way to easily test their cows to see if they’re pregnant or in heat. Cows must be bred and produce calves in order to produce milk, but if a cow runs dry, it’s difficult to tell whether it’s due to lack of pregnancy or a common udder infection known as mastitis. There is no simple test for cow pregnancy as there is for humans, but scientists who went on the trip came up with the idea to adapt existing nanopatterned paper sensors to detect bovine pregnancy. The Gates Foundation originally planned to allocate funding for two or three ideas that came out of the trip, but there were so many (more than 200, later consolidated into 22 concepts), that the foundation is encouraging the scientists to pursue as many as possible. The Meridian Institute will initially focus on diagnostic tools for mastitis, the new milk container, tick-borne disease and other livestock diseases, safety tests for milk, a modified plastic tank for maize storage, and a new way to dry cassava. The Meridian Institute is now working on starting up a foundation that would serve as an “incubator” to help develop, test and bring these ideas to commercialization, according to Barker. “The major challenge now is to make sure the ideas that came out of the trip reach the farmers in Africa,” he says.